What if you have a car accident? Insurance. What if you receive a serious diagnosis? Insurance. What if a fire destroys your belongings? Insurance. What if someone steals your possessions? Insurance. What if you lose your cell phone? Insurance. Whether or not you like it or want to pay for it, insurance is the necessary, responsible, wise choice. Just in case. What if God says otherwise? Let’s define insurance as “a backup fund for an emergency situation.” Does the Bible speak of such an “emergency fund”? Yes, the ant gathers for expected needs. Everyday living. As for “what ifs,” you might say Ecclesiastes has a word or two. You know not what disaster may happen on earth. If the clouds are full of rain, they empty themselves on the earth, and if a tree falls to the south or to the north, in the place where the tree falls, there it will lie. He who observes the wind will not sow, and he who regards the clouds will not reap. Does the Bible suggest any kind of “insurance plan” at all? Note what Paul presents to us under the guidance of the Holy Spirit. My question is, Should Christians purchase insurance? Does it reveal wisdom or fear? Foresight or presuming upon tomorrow? The Bible is certainly not clear. But it does speak much of a person’s attitude towards their money and possessions. If we’re not trusting in insurance to take care of the unexpected, why do we have it? What if the what ifs never happen? That’s a lot of money to spend on chance. There is much to consider, especially when we are pressured to have insurance we don’t want in the first place. But that’s another issue entirely. My observation is simply that the Bible speaks about money, possessions, work, making plans, and responding to the unknown. But rather than the idea of a “backup plan,” it urges Christians to live as strangers and pilgrims in this world. To walk by faith, not by sight. To give, not to hoard. To trust, not to worry. To help those in need, not to rely on any insurance company to do so. And so I question my motives and actions. Am I depending on human plans and resources instead of relying on the great Owner of all? Am I taking matters into my own hands instead of trusting the One who holds the universe in one palm? Am I adopting a human system which disregards the instruction of an infinitely wise God? He surely sees no “emergency” with his all-knowing eyes. And I’m supposed to see like him. I have my share of modern-day conveniences, and I’ve met society’s expectations when it comes to insurance. But the Bible keeps me wondering if I shouldn’t. And my bank account. It makes me wonder, too. Certainly an interesting thought, some may consider insurance as just a tool God has given us to use. I’m not sure really, but it is pretty well required by law as you pointed out and should be obeyed for that reason as you seem to imply. This makes me think some of the expense sharing ministries might be a good alternative fitting somewhat closer to what 2 Corinthians 8:12-15 and Luke 3:11 speak of. I would be curious to know how someone sees it as a tool God has given us to use. And yes, I was implying that perhaps we should have insurance because it is required of us. Though I’m not convinced on that one, either. Ah, so many things to think about. To answer your curiosity, I would say insurance has been a much appreciated help to many people in time of need. We’re not talking about hoarding treasures or worrying about the future; we’re talking about putting back for what we need. Yes, we trust God to help us in time of need, but God has also given us the ability to prepare via insurance and savings. In that sense God has helped us already. We now need to be careful that we are not putting our trust in riches and insurance. What we need to realize and be thankful for is that God has given us our money be a little or a lot and has allowed us to afford to have insurance. We still give God all the credit – not the insurance nor our wealth nor anything else. Now, I know you’ve spoken of the difference between expected needs versus unexpected needs, but having an emergency fund or insurance is not actually much if any different from preparing for an expected need when you think about it. For most people emergencies are almost an assured part of living on the planet. We may not worry about them, but ready or not, they come. We prepare for emergencies in general as an expected need, and sometimes we prepare specific emergencies that we might assume are more likely such as getting flood insurance if you live in a flood zone. If there’s one thing the Bible teaches us, it’s that we don’t live in a perfect world, and bad things will happen. Again, we don’t trust insurance, we trust in and are thankful to the God Who allowed us to get insurance! Two other points is that there are times that we draw out less than we put in, but in that way we are helping others in the system. Secondly, insurance allows the church to use its money for other things in the work of the Lord such as helping those who can’t get insurance or who are even homeless or who are missionaries. True, our insurance system is a far cry from a perfect system. There are abuses and misuses and shortfalls, but it has its uses. In a way this is somewhat like the question of money and treasures in general. Are they evil? We are told not to covet them and not to lay up treasures on earth, but are they evil if we have them? No, they are not in and of themselves evil. Various godly people throughout the Bible were wealthy even. It’s not a sin to be wealthy, it’s a sin to covet wealth and trust in riches apart from God. I don’t think it’s a sin to have insurance, but I think it’s a sin to covet it and trust in it apart from God. Thanks so much for the discussion, Robert. You bring up so many good points. Where I question the idea that insurance can be seen as a tool God has given us, is the fact that anybody could call even a sin a tool God has given. For example, I think the Bible clearly teaches that birth control is wrong. But many [edit: most] Christians see it as a tool God has given to accomplish life to their satisfaction. So for me, to simply say “insurance might be a tool God has given us” isn’t satisfactory to me. A car is not in Scripture but we can see how it’s not a sin to use it as a tool for God’s purposes. With insurance, I’m not so convinced, because it would seem that God has shown us what “insurance” should look like or perhaps that we should respond to life’s emergencies in a different way. If God has given instruction on how to plan ahead and provide for our needs and take care of unexpected difficulties, then we should follow his plan and not our own devices. So, again, my question is, Are we choosing a path that isn’t part of God’s design or plan for us? I’m not sure, but it really keeps me thinking. But you definitely have some good thoughts and some very valid ones. I’m not saying I disagree with you entirely. I’m just open to saying that insurance is not a biblical option for the Christian. But I’m not saying it quite yet. Clarification to my last comment. Should I determine that insurance is not a biblical option for the Christian, it’s not as though I would make a public statement to the effect that this is true for all Christians. It would be more of a private decision based on my studies of God’s instructions in his Word. Didn’t want that to come across in the wrong way. Yes, the argument is not one to be used on a whim. By itself can be terribly abused, but that is why I would combine it with verses and examples such as the ant speaking of self-preparedness and being responsible by preparing for expected needs which emergencies pretty much are since we live in a world ruled by sin. Interesting posts on treasure by the way. I’ve always thought of treasure as simply something of value which hopefully we all value certain things on earth such as each other and life and etc… Perhaps treasure can be just things we value, or perhaps it not so simple. Perhaps instead I should have just used the verses pertaining more directly to wealth like not loving money. But if I had, I might have missed your treasure posts hehe. True. And I don’t mean to overlook the ant. My questions about the ant are, (1) How should the book of Proverbs be applied? (2) Is the point of the “ant verse” preparing for what comes ahead, or simply working hard and being responsible? (3) Even if the ant shows the importance of thinking ahead, does it imply that we should spend money on something that may or may not occur? So, the ant is a whole other fun topic. But to clarify, my primary question in this whole insurance thought is not so much, Am I trusting in insurance instead of God…but, Is insurance a man-made idea that is not part of God’s design or desire for us as Christians? The conclusion I’ve come to so far is that disasters and emergencies are certain to occur. They may not occur to us, but they will occur to someone. When we pay insurance we are both thinking ahead for ourselves and helping others. As much as I think our insurance system (among other things which affect it) could improve, for now, this is reasoning I guess I can live with. There’s a lot of things that cannot be reconciled with the Bible and Christian living. Parts of our insurance system are absolutely that way being totally against God, but as a concept, insurance I think is at least somewhat reconcilable at least for me. I certainly see your line of thinking. And I may even come to agree with it entirely. 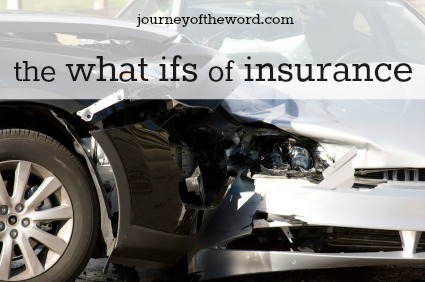 I like to question things first, because I know my tendency is to accept things, like insurance, because “everybody’s doing it.” I’m trying to challenge myself to start with Scripture and see if there’s reason to believe that something like insurance is, in fact, non-biblical. As I haven’t studied the entire Bible very thoroughly (some parts not much at all), I think there’s a good chance I’ll discover something I hadn’t considered before. I want to buy insurance not because it’s considered the acceptable, expected thing to do. I want to buy insurance because the Bible leads me to do so. In Jesus (through his word), we find “everything we need for life and godliness.” Just because something is not in the Bible doesn’t make it right. See related post: https://journeyoftheword.com/2014/12/19/what-the-bible-doesnt-say/. So, anyway, I do appreciate your thoughts. I just wanted to clarify my approach. I hope others will join you in thinking about these topics. That’s one of my main purposes behind this blog: to encourage people to think. I don’t intend to push particular views on anyone. I rather hope to point them to the Answer Book. Thanks again for the discussion. It’s been great. I’m glad you posted this as I seem to remember this being an issue that was brought up years ago. I don’t suppose I ever really thought that deeply about it and probably just discounted it until I read your post in which you made some good points. You seem to have accomplished your task in getting me to think and actually form a stronger opinion on the issue lol. By the way, even if you study every single word in the Bible in immense detail, you can still read and learn new things from it! It is not just a book with words on a page… not just a lifeless collection of letters from God to us… it is living and powerful! Great article! Some great questions that I have asked myself many times. You make lots of challenging points here, Lydia. Very thought-provoking! Thanks for sharing this at Coffee and Conversation last week…we’ll be featuring this at tomorrow’s party! I’d sure love to keep that money in my pocket but most insurance (auto, health, and anyone with a mortgage; homeowners) is required so it’s not like I can opt out of it…. though I do think of all the money we spend on it each year and think if we had kept all that money we’d have a large enough nest egg that we surely wouldn’t need it.